Food coloring is often used by young people to temporarily add exotic, colorful streaks to their hair. Food coloring easily stains anything that it comes into contact with including hair. 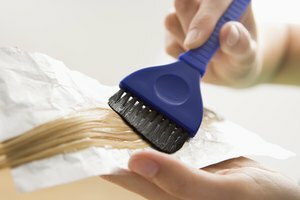 Those with light-colored hair and/or hair that has been chemically processed are especially in danger of cuticle stains caused by the application of food coloring to the hair. Cuticle stains fade over time, but they are stubborn. What was meant to be a temporary splash of color could end up lasting for weeks if the proper steps are not taken to remove the stain. The process to remove a cuticle or surface stain on any type of hair is called a soap cap. Pour equal amounts of clarifying shampoo and 5-volume hair-color developer (H2O2) into a color bottle. Screw on the lid, and shake the bottle vigorously until the mixture is well blended. Set the bottle aside for later use. Rinse the hair thoroughly with warm water. Pour a dime-sized amount of clarifying shampoo into the palm of your hand. Rub your hands together to distribute the shampoo evenly on the insides of your hands and fingers. Work the shampoo through the hair with your hands and massage into a deep lather. Wait five minutes. Rinse with warm water. Put on gloves, and apply the soap-cap mixture to the hair by squeezing the color bottle with the tip pointed toward the hair. Work the mixture into the hair with your fingers. Continue applying more mixture until the hair is thoroughly saturated. Set the timer for 10 minutes. Rinse the hair with warm water, and check the hair to see if the stain has been lifted. If the stain is gone, move to the next step. If not, reapply the soap-cap mixture and wait an additional 10 minutes. Keep repeating the soap-cap until the stain is removed. Apply a generous amount of conditioner to the hair, and wait five minutes before rinsing. Towel dry and style the hair. Soap caps can often leave the hair feeling dry. Use a good hydrating conditioner for approximately two weeks after performing a soap cap.